By Dan Ambrose: There’s talk on social media that Keith ‘One Time’ Thurman (29-0, 22 KOs) could be making a voluntary defense against former four division world champion Adrien ‘The Problem’ Broner (33-4-1, 24 KOs) in his next fight. The Thurman vs. Broner fight isn’t confirmed. It’s still at the rumored stage, and hopefully it doesn’t progress passed that level. Putting Thurman in with Broner is going to make a lot of boxing fans angry at ‘One Time’, and hopefully for his sake the match doesn’t get made. 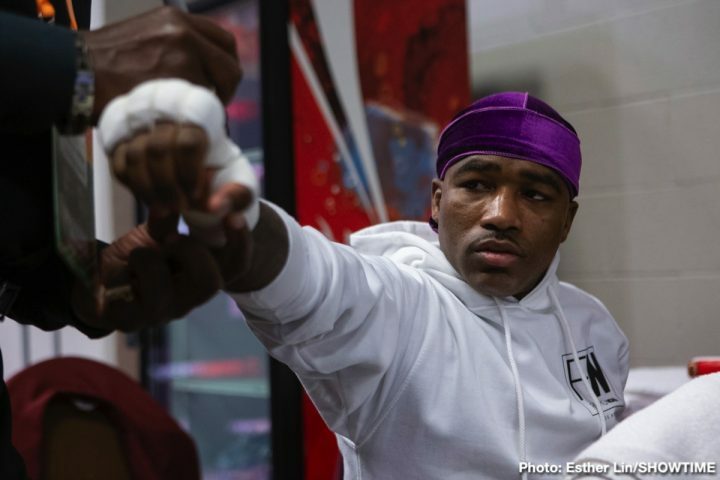 After Broner’s loss to WBA secondary welterweight champion Manny Pacquiao last January, he should be getting back in line to earn a world title shot rather than having it given to him immediately against Thurman. Thurman-Broner would have been a good fighter back in 2015, before Adrien was beaten by Shawn Porter, Mikey Garcia and Manny Pacquiao. Unfortunately for Broner, he’s not been winning fights recently, and he’s looking like a guy that is living off of yesterday’s accomplishments. A fight between Thurman and Broner would be a bad sign for boxing. It would show that it’s a race to the bottom with undeserving fighters being given title shots, while guys that have plied their trade and worked hard for a crack at a belt are ignored. Broner’s ring record in his last 4 fights is 1-2-1. If you take away Broner’s controversial 10 round decision win over Adrian Granados in 2017, a fight which many boxnig fans felt that he should have lost. Broner, 29, is coming off of a one-sided 12 round unanimous decision loss to WBA ‘regular’ welterweight champion Manny Pacquiao (61-7-2, 39 KOs) last month on January 19. The fight wasn’t close, although the scoring from the three judges gave the appearance that it was a competitive fight. They scored it 117-111, 116-112 and 116-112, all for Pacquiao. Boxing News 24 had Pacquiao winning 12 rounds to 0. Broner came close to winning none of the rounds of the fight. The way that Thurman looked against Josesito Lopez, he’s not going to stay a world champion for much longer. Those 2 years of inactivity from 2017 to 2019 took a lot out of his game, and he’s not looking like the same fighter once was. You have to realize though that even when Thurman was at his best, he was barely better than Danny Garcia and Shawn Porter. It stands to reason that if a fighter like the 30-year-old Thurman is unable to fight for two years due to injury problems, his boxing skills are going to deteriorate a certain extent. If this was a golfer like Tiger Woods, he wouldn’t be better for not having competed in his sport for 2 years. Thurman wanted to fight in the last two years, but he’s had an elbow and hand problem that has kept him inactive. Thurman finally came back from those injuries to defeat Lopez, but the performance left a lot of doubters from fans that suspect that Keith’s time as the WBA welterweight will soon end once his management at Premier Boxing Champions puts him in with a live body.